The sinuous rilles in this photograph, east of the Aristarchus Plateau, are a particularly interesting complex of these unusual features for which no entirely convincing terrestrial analogs have yet been recognized. 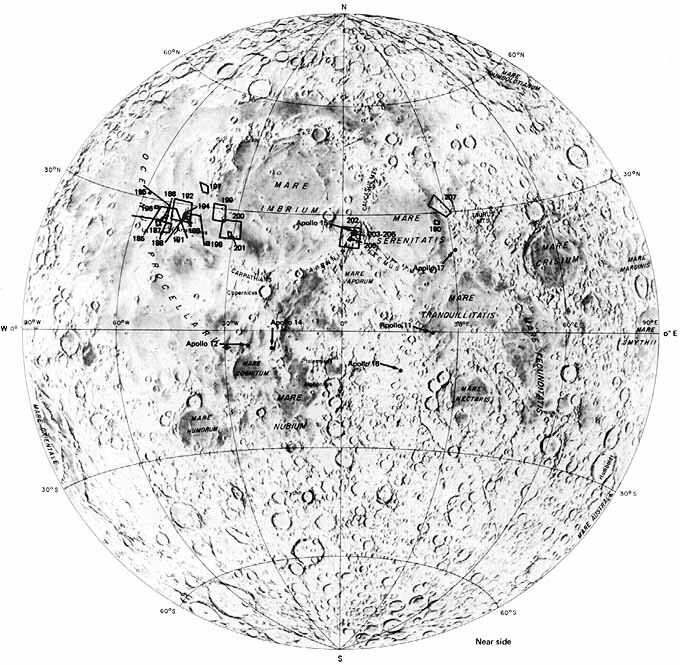 The rilles are at least partly controlled by fracture and most originate in craters. Rille A, beginning on the flank of the crater Prinz, appears to have had a distinct two-cycle history, producing crater-in-crater and rille-in-rille structures. Rille B crosses a ridge of highland material without deviation or deformation, suggesting that the feature was superposed - that is, let down - from an earlier higher mare surface; the ridge appears to have been eroded. A shallow narrow rille (not visible in this photograph) occurs within the broader valley of rille C and is traceable across the elongate collapsed depression that bisects the main rille. 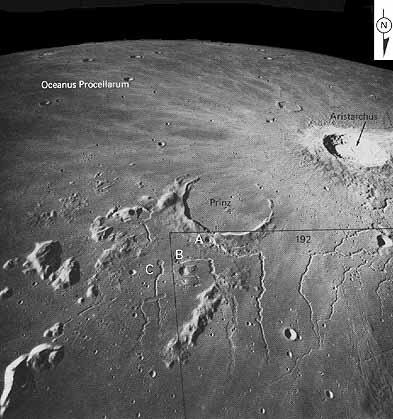 Craters at the heads of rilles probably represent source vents for fluids that either eroded the rilles or formed lava tubes that drained, contributing to the volume of mare lava in Oceanus Procellarum. Report Source: NASA SP-362, Page 184, Figure 191.